Now that spring is truly upon us, what better time to start thinking about a new mower to replace that clapped out heap of decayed plastic and metal you have in your man shed. Well, we’ve had a damn good think about which lawn mowers we like the most and which ones are best in each of the following categories: cordless, corded, petrol, robot and ride on. And here they are in all their shiny splendour. Fret not if none of these tickle your fancy bits because T3 world also has a tranche of full round-ups in every category of lawn mower known to mankind – short of any rocket- or nuclear- propelled models we don’t know about. This cordless lawn mower is what you need if you have an average-sized lawn. This smart cordless model is ideal for smaller city lawns. It comes with a 35cm cutting deck, a 40-litre collapsible mesh grass collector, five cutting heights (20mm to 70mm), a high-performance 40v Li-ion battery and the quietest brushed motor you’ve ever not heard. Indeed, if you have nervous pets around, then this is the model to choose. The Greenworks cuts exceptionally well while its wheels are of a decent enough size to tackle most gnarly terrain. At just 15kgs, it’s also easy to manoeuvre and a doddle to store. Expect around 40 minutes of cutting time on a single charge. This petrol mower is what you need if you have a large lawn. Petrol mowers are notorious for being temperamental, especially after being in storage for a long period of time. Well, if you want a petrol mower that will start first time even after a year in the shed, then this is the model to get your mitts on. 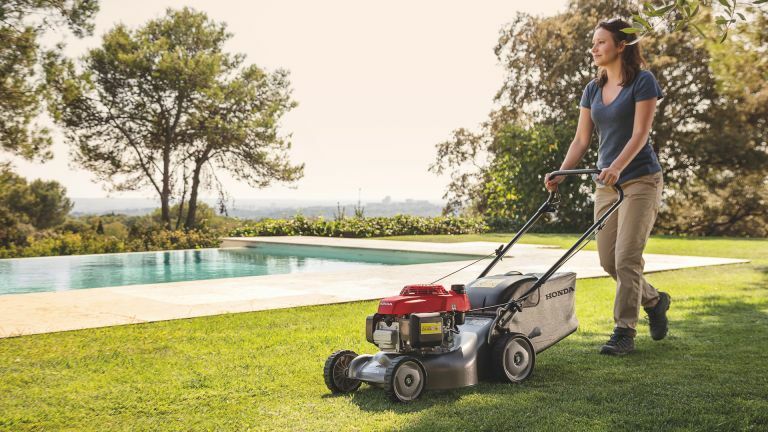 Equipped with a reliable pull-start 160cc Honda engine and a wide 41cm sitting deck, this is the machine to reach for when your lawn’s too large for a cordless or corded model. The Honda HRG 416 doesn’t have self propulsion but it’s easy to push. It also features a wider cutting height range than most mowers – from a near-bowling green short 20mm to a meadow-like 74mm. Its 50-litre grass collector, meanwhile, is big enough to contain a large dollop of sward cuttings. A top-dollar option for those who enjoy disturbing the peace on a sunny summer’s afternoon. This robot lawn mower is what you need if you really don't want to do any mowing. Attention all land owners with a tidy wad in the bank! You don’t want to be faffing about pushing machines up and down the lawn and walking to and fro with heavy baskets of grass when you can have a robot do it all for you, day and night, all the time. In the pantheon of autonomous lawn mowers, the albeit pricy Robomow RS635 is an unequivocal winner. All you have to do is lay a wire around the perimeter of your sward and install a little charging station, and the Robomow will do the rest, zig-zag cutting everything in its path for about 80 minutes at a time before returning to the charging base for a top up. Then it’ll head out again until the entire lawn looks like it’s been manicured by Augusta’s green keeper. The Robomow’s huge 56cm cutting blade gets through a lot of grass in a short period of time, and is capable of handling gardens with an area up 5,000 square metres. The perfect option for rich but lazy garden owners. If you have a large garden with a power supply in the vicinity, consider this highly reliable cutter from Bosch. Its wide 43cm cutting deck will cover a lot of ground in one swoop while its 50 litre grass box means fewer trips to the compost heap, while the cable means fewer trips to the recharging station. None, in fact. Bosch’s multi-position Ergoflex handle bar system is a great feature that’s ideal for both righties and southpaws – it really is comfortable to push around. Cutting wise, this is an exceptional machine that cuts right to the very edge of borders which in turn means less strimming afterwards. It also collects leaves while it mows using innovative airflow technology. The Rotak 43 is one smarty-pants lawn mower that will likely go on trimming for years with just a few blade changes now and then. I know this because I own one – how's that for an endorsement? When your lawn space approaches an acre in size (about half a football pitch), you’ll be much better off with a ride-on mower. Apart from being just about the most fun thing you can do on your lawn, this Teutonic petrol machine from STIHL will do the job in a fraction of the time. It is, after all, designed for lawns up to and beyond 4,000m2 (an acre or more). Comical looks aside, the STIHL RT 4082 boasts a huge 80cm cutting deck and a centrally-located 13hp Briggs & Stratton engine married to a hydrostatic gearbox and variable speed drive for smooth and very accurate manoeuvrability. And because you sit up high and in full view of the front wheels, it’s almost impossible to ride slipshod over the partner’s prized Tulip collection. The grass collector tucked low behind the driver’s bum can hold a massive 250-litre of grass cuttings and is easily emptied by a relatively simple tug of a lever. If you’re in the market for a ride-on mower that tackles large gardens with aplomb, then this is the one to jump on, dude.